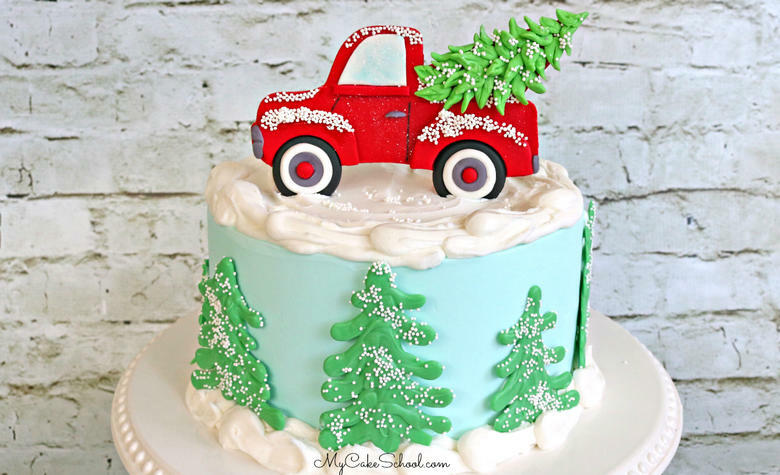 With Christmas just around the corner, we thought it would be fun to create a red pick up truck cake topper tutorial for you! This adorable design is SO simple to make, and we love how it turned out! Have you noticed that there seems to be a surge in Christmas decorations that feature red pick up trucks lately? They are everywhere! From pillows and ornaments to Christmas Cards and wrapping paper- and of course, in Hallmark movies which I’m watching constantly these days! Gum paste is always my preferred medium whenever I make 2D cake toppers that are simply cut-outs with anchors attached. The reason is that gum paste dries very firm, making it much less fragile. Gum paste is food safe but not edible- I love it because it allows us to create all sorts of fun or personalized cake toppers that you just cannot find in a cake shop. When kneading tylose powder into fondant, I usually just add the powder bit by bit until I notice a change in consistency. A very general rule of thumb for creating “gum paste” from fondant is to add one rounded tablespoon per pound of fondant. You can estimate up or down from there based on how much fondant you need. Roll your fondant/gum paste to a thickness of about 1/4 inch. A very thin cake topper would be more fragile. Next, cut out your shape, in our case, the pickup truck! Allow to dry on a parchment line cookie sheet. (Parchment breathes more than waxed paper). Allow at least a couple of days to dry to be on the safe side. My truck was dry after 24 hours, but dry times can vary depending on your location, humidity levels, the type of gum paste or fondant you are working with, etc. Once the gum paste truck is dry, flip it over and attach anchors (we used lollipop sticks) with very lightly dampened strips of gum paste. Allow to dry. Flip over and lay on shredded paper towels to give it support as you layer on your remaining details like the window, wheels, fenders, and tree. *If you’re looking for an alternative to gum paste, you could also create a truck from a cookie– you can use our truck template with the rolled cookie dough! We hope that you enjoy the video! If you make a cute truck cake topper of your own, we would love to see! Looking for more ideas for Christmas cake designs and recipes, make sure to check out our Roundup of Favorite Christmas and Winter cake recipes, designs and inspiration! In this tutorial, we decorated an 8 inch cake frosting in tinted buttercream (our fluffy vanilla buttercream recipe). Our blue frosting was tinted with Americolor Sky Blue. Gum Paste or Fondant with Tylose Powder Kneaded into it. *Candy Coloring: I used Americolor Candy Coloring in Green to tint my candy coating. You could also use pre-colored candy coating if you’d rather. This is one of my favorite video’s! 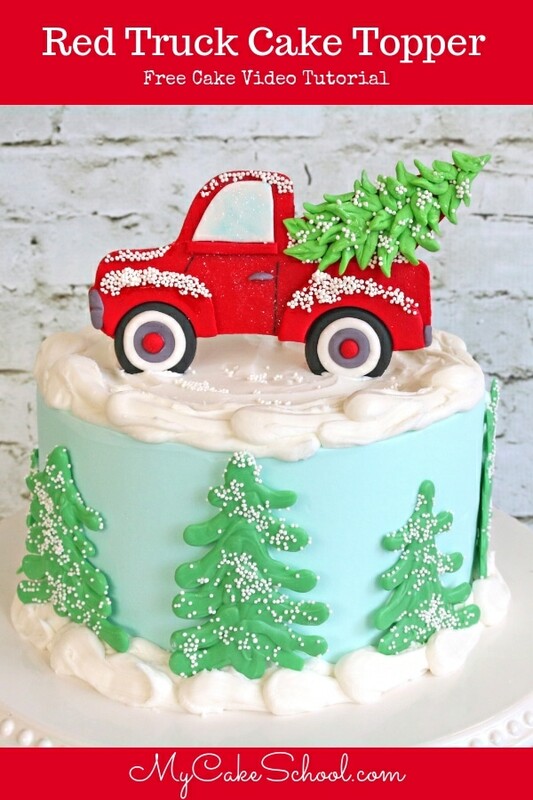 My Mom loves the Red Truck decor, so I hope to make this for our Christmas celebration. I know she would love it!!!! Thanks so much for this video. You say that Gumpaste is food safe but not edible. I make Gumpaste flowers often, and though I don’t eat them because they are rock hard, my daughter likes to eat them. She has never gotten sick. Are they really not edible? @Melissa– That’s funny that your daughter likes to eat them! I think that there is actually a nutrition label on the side of most gum paste containers and so it’s probably harmless. It’s just that it dries so firm (and most think the taste is bad also) so I wouldn’t recommend it for decorations that will be eaten. Hi Melissa, love the cake super cute! Not cake related but can you tell me where you purchased your small green and red knives? Thanks! Hi Laura, We bought ours at a local kitchen shop, they are made by Zwilling J.A. Henckels twin grip paring knives. Below is a link to what I found online. Scroll down to the ones sold individually. The description on the blue handled one sounds like our red knife that has a 3 1/2 blade. Our green knife has a 4 inch blade. I have been trying to find another green knife and cannot locate one. Loves this tutorial! Thanks for sharing it! This is the first time I have really tried anything with fondant, and it was a great place to start. I definitely learned a lot in making the truck. It turned out very well. Merry Christmas! !